So what can be done if you are a leading Central European advertising agency which finds that it is drowning in social media management concerns? If you’re a feisty company like Triad, you get motivated to create your own management tool. Like many other marketers who were trying to manage social media channels without much success, the company was running into misunderstandings and complicated internal processes as it tried to harness the power of social media marketing for its clients. Email, PowerPoint presentations and Google Docs just weren’t cutting it for everything Triad wanted a content marketing management tool to accomplish. Upon reviewing the available tools, they found they were just too cumbersome to work with or really were not helpful in answering the basic questions of how best to advertise on Facebook or how best to advertise on Instagram. Because they knew that the benefits of social media could help to build brands and spread awareness for their clients, Triad set its in-house developers to work on the project. The result is Kontentino, an intuitive social media tool for agencies and clients which helps to manage content on Facebook, Twitter, Instagram and LinkedIn, Google+ and Pinterest. Although Kontentino’s developers thought they had done a pretty good job of creating a simple-to-use, yet sophisticated software tool to manage social media content, the strengths of this program became readily apparent when they started offering it to other social media managers. Although it has only really been available commercially since January 2016, Kontentino has already been ranked by Capterra in the Top 20 of Most Popular Social Media Marketing Software, and is a G2 Crowd 5-star “High Performer” for Spring 2018 – pretty impressive results for a relative newcomer. Product Rating: eClincher received 5 stars based on 179 reviews, Hootsuite received 4.5 stars based on 787 reviews, Monday.com received 4.5 stars based on 797 reviews, and Kontentino received 5 stars based on 46 reviews. Users: Although Hootsuite is the most widely used, it focuses more on SMB and Enterprise. Kontentino is aimed at advertising agencies and social media teams that have a complicated workflow which needs to be streamlined. Pricing: Kontentino can be as low as $10/month for one social media profile with up to three users. Plans include a one-month subscription, a six month plan with a 5% discount, or a one year subscription with a 10% discount. Hootsuite is $19.99/month and eClincher is a hefty $49/month/user. All have free trials, but only Kontentino and Hootsuite offer free versions. Features: Social media management features listed for Kontentino include automated publishing, content management, customer targeting, multi-account management, multi-user collaboration, post scheduling, and reporting/analytics. One handy priceless feature is a post checklist, where Kontentino reminds users of guidelines and rules they set in their content strategy. Screenshots: Of the screenshots presented, Kontentino appears to be the simplest and most intuitive. Facebook posts can be viewed in both calendar format, for month-at-a-glance planning, and list format to immediately view comments and status updates regarding individual post listings. Best performing posts are highlighted for further analysis and review. Accountability: Users can easily distribute budget recommendations across posts before seeking client approval. This means all parties can see the planned boost budget in the campaign or monthly summary so that the agreed-upon monthly boost budget limit is never exceeded. Flexibility: Kontentino adapts to the latest marketing options, enabling users to incorporate a Facebook or Instagram Carousel, 360° photos, or Instagram stories into their content. Adding in other social media outlets such as the ever-popular Twitter and growing Pinterest is also easily enabled. Training: Options include in-person, live online, webinars and documentation. Kontentino clearly wants users to benefit as quickly as possible, and offers a full range of content creation tutorials on its website. Lessons begin with a main features overview, which introduces the simple user dashboard. The next tutorial demonstrates how easy it is to create and plan Facebook posts. 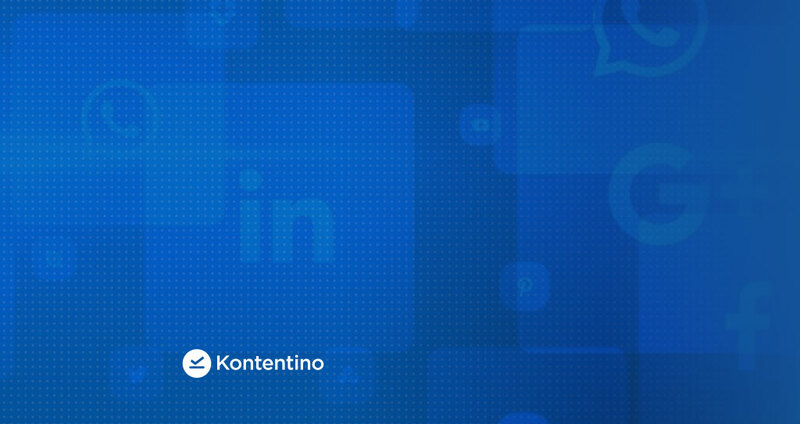 The third video covers how to connect social media channels with Kontentino, and provides more insights about structuring content into content plans. Additional topics include how to collaborate with a team, approval workflow, possible post statuses, client review and approval process, and editing settings. The final video covers how to schedule posts in Instagram. All in all, Kontentino stacks up very well against its competition in the content creation and planning niche. Best of all, the company makes it possible for prospective users to perform their own reviews with a thirty day free trial. If you are a freelancer, agency or brand that is planning a high-quality social media program in the rapidly-evolving world of viral marketing, make Kontentino your first stop for finding a solid foundation on which to build. For further information on the Kontentino social media management tool, visit the company’s website at http://www.kontentino.com and sign up for a free trial or request a demo. About Kontentino: Kontentino is a social media management tool which enables social media managers to seamlessly collaborate with clients on and approve social media content and ads. It has been ranked by Capterra in the Top 20 of Most Popular Social Media Marketing Software, and is a G2 Crowd 5-star “High Performer” for Spring 2018. Visit the website at https://www.kontentino.com to sign up for a free trial or request a demo. “Like” the Facebook page to receive tips on managing a LinkedIn social media marketing strategy.